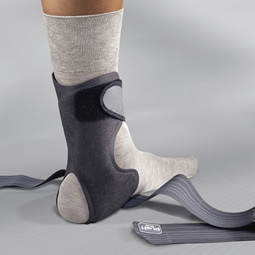 The Push ortho Ankle Brace Aequi is an effective ankle orthosis which strikes a balance between efficient mechanical support of a disabled ankle and good wearer comfort. 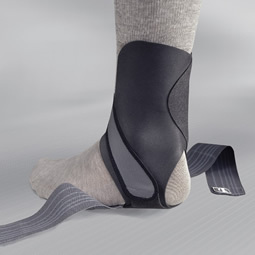 The rigid support is situated exclusively on the medial side of the ankle and has recess for the malleolus. The lateral side is made from preformed foam, which easily adapts to the individual anatomy. The orthosis is fastened by means of a diagonal strap. Elastic straps apply pressure around the ankle. Inversion/eversion movement of the ankle is restricted while plantar and dorsal flexion is allowed adequate freedom. This means that no inhibition is felt during normal walking and running. The Push Aequi is worn over sock, and optimal stabilisation can only be achieved if it is worn with a closed (laced-up) shoe.